From the birdseye vantage of her helicopter, police pilot Kathryn Chapman saw disaster unfolding. An abandoned car sat on a level crossing with police chasing the driver on foot while a passenger train hurtled towards the vehicle at 50mph. Then, in a scene that could have come from a Hollywood movie, Mrs Chapman swooped to the rescue. 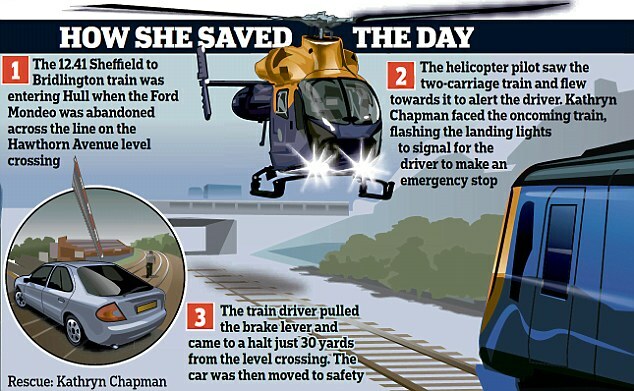 Flying at three times the speed of the train, she dropped to little more than 60ft above the ground and managed to get ‘ahead and just above’ it. 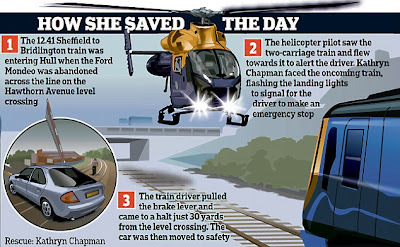 She signalled to the driver to stop by swinging the aircraft round to face the train and flashing the landing lights. Realising there was an emergency, the driver slammed on the brakes and brought the train to a halt just 30 yards from the crossing. Mrs Chapman knew exactly what to do because she was also a qualified train driver and briefly had a job driving the same type of train four years ago. This meant she knew what signals to use to get the driver to stop. 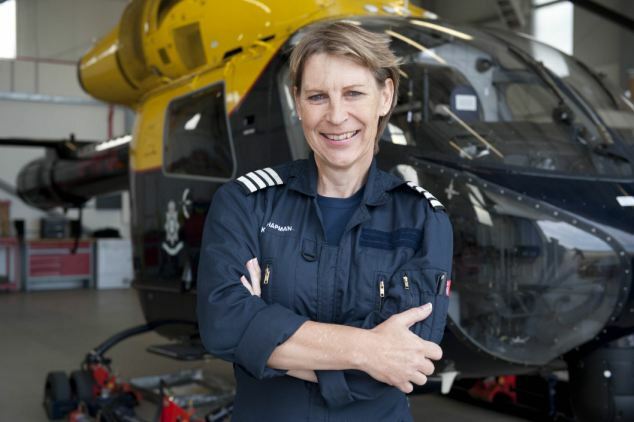 The pilot, who is also a Royal Navy Gulf War veteran, estimated the train was travelling at around 50mph before she intervened and the helicopter swooped down at around 150mph to catch up. Learning with Sarah Palin is fun!